As a parent of two school aged children, I cringe when I think about how many plastic bags are used in our house. Whether it is daily snacks or leftovers, we use a lot of plastic bags. It's crazy to think about how wasteful these bags can become. Between physical waster in a future landfill to money spent on the purchases, there has to be a better, greener way. I've found it. ReUsies. ReUsies are re-usable snack and sandwich bags. Each bag is made of 100% cotton. It is lined with leak-resistant nylon and secures with a hook and loop closure. By using one ReUsie bag your family has the potential to keep hundreds of plastic bags out of our landfills. Also, ReUsies come in fun colors and designs. From bright colors to fun designs, you can definitely find a version that represents your or your kids' style. The sandwich bag holds up to a full size sandwich or a bagel. The smaller size is perfect for snack sized pretzels, carrots or half a sandwich. With the flap closure, the bags are easy for even little hands to use. I've given my kids the ReUsies for their daily school snack. The smaller size holds just the right amount for school snack time. Whether I choose Goldfish or raisins, the kids have a great snack and we're helping to reduce our waste. 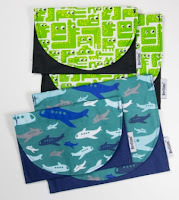 The kids like the fun designs and they feel good that they aren't throwing away more plastic bags. The ReUsies are machine washable, dishwasher safe or hand washed. I've thrown mine in the top rack of the dish washer. Just a heads up that hand washing can extend the life of this product, but I'm all about convenience. ReUsies are available on-line at http://www.reusies.com or at local retailers, check the website for a location near you. A two pack, consisting of both the large and small bag retails for $16.00. I have a two pack in your choice of colors to giveaway away. Please use the Rafflecopter to enter. There are no more excuses to keep using plastic bags for snacks. Save the planet and your money by using reusable items like ReUsies.